You are the stories you tell. Or at least I am, anyway. What one choses to relate really reflects the path one has chosen to get through this world and the direction one’s head was pointed in — to the heavens or at one’s muddy boots — while doing it. Wheelying Sweet Doris around Mount Vernon Circle on our first date, or seeing the Biker Genie emerge from the walls of Saint Alfonso’s Canyon at sunset, I personally have a million stories, and haven’t even scratched the surface of them all yet. Your stories describe the energy you are, and actually become you when your flesh and blood have finally left this earth. The stories of groups of people — sports teams, military units, companies — are more complicated mythologies. The legends of the Motorcycle Industry are manifold. Harley and Davidson out at work in the shed. Honda Engineer Kiyoshi Kawashima successfully using Honda’s first 4 stroke motorcycle engine to crest the Hakone pass. Burt Munro clipping 200 miles an hour at Bonneville on a 1920 Indian when the bike was over 40 years old. If you happen to be Polaris Industries – the current owner of Indian Motorcycles – the story of Burt Munro is your most precious jewel. Polaris — in purchasing Indian — had the unenviable task of trying to convince the marketplace that their company — and their motorcycles — were the continuance and legitimate inheritor of the Design, Performance and Competition heritage of the Springfield, Massachusetts Indians — a much beloved motorcycle that hadn’t truly existed since 1953. That the Indian Legend still seemed to have enough heat left in it to draw buyers — to draw the faithful, the believers, after a 60 year dead — is one of the miracle stories of a brand that flat refused to die, even after having many, many chances to do just that. But if you are Polaris — those legends of Indian — and especially that of Burt Munro — are the stories you absolutely must wrap around yourselves if people are to imbue you with the good will and dedication of a long-lost past to which — objectively — you are only most tenuously connected. I recently had the opportunity to write about Indian and their Motorcycles, after a much-anticipated test of an Indian Roadmaster Motorcycle. Being a bit of a geek, I was doing all I could to learn about the history of the Marque — even having asked, without success, if there was a corporate archives or historian I could use to help with research. Having failed that, I resorted to Internet-based research, where Indian enthusiast clubs helped out tremendously. While looking at the Company’s online history, I saw something that immediately struck me as odd. 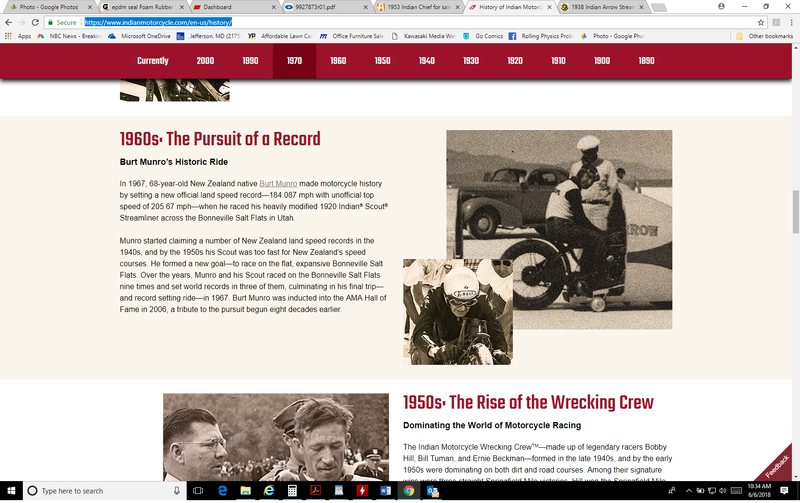 On the Indian Motorcycle Company’s History page “The Story of a Legend” — there is a section entitled ‘Burt Munro’s Historic Ride’. There are two pictures　— One of Burt Munro on his streamliner with the shell removed. The other picture is of Hap Alzina’s Indian Arrow streamliner. Burt Munro’s first visit to the US, and to Bonneville, was in 1962. He ran again there in 1966 and again in 1967. His 1967 Record Run at Bonneville is absolute legend, the subject of A Ripping Yarn and Barn Burner of a Hollywood movie – ‘The World’s Fastest Indian’ . These two pictures were taken almost 30 years apart. It’s easy to see from just the cars in the background and Ludlow’s leather helmet. Burt Munro didn’t come to the states until 1962. The second picture isn’t – as it is credited — Burt Munro – it’s clearly Fred Ludlow. So some web designer somewhere was given access to a set of image files, was told to whip up an Indian History page, saw two old dudes on old motorcycles sitting on the salt and figgered well eff it, that’s close enough. And no one that worked on it, or that reviewed or approved it, or anyone that has looked at it since, knew enough or cared enough to get the story right. And if they can’t get this story right, then the claim that this is their hallowed past – that they are ‘America’s First Motorcycle Company’, rings as hollow as hollow can be. I’ve reached out to the company every way that a resourceful man can think of. Three weeks after that, the ‘Definitely Not Burt Munro’ photo is still posted. That, I guess, tells a story, too. On July 2nd, 2018, Indian Motorcycle updated their corporate website’s history page. Where there had been two photos of Burt Munro and Freddie Ludlow, there is now a single picture of Burt. It’s a much better picture of Burt. This entry was posted in MotoHistory and tagged Burt Munro, Indian Motorcycles, Legends, Polaris Industries, The World's Fastest Indian. Bookmark the permalink. Just looked and it has been fixed.